Living on the Brink: What Happens If All the Sharks Die? Photojournalist Paul Hilton has watched countless sharks have the fins sliced from their bodies, some of them still alive and left to suffer an excruciating death. The thought almost brings him to tears. The Rainbow Warrior travels in the Pacific to expose out of control tuna fisheries. 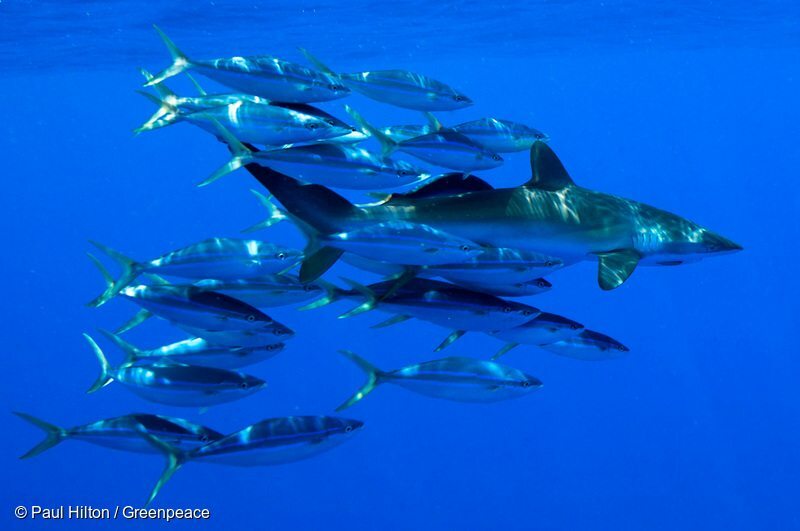 Tuna fishing has been linked to shark finning, overfishing and human rights abuses. This article was originally published by Greenpeace International on September 18, 2015. Conservation photojournalist Paul Hilton is on board the Greenpeace Rainbow Warrior as part of its Pacific tour to document the out of control tuna fishing industry. That is an industry that’s not only leading to a scary decline in tuna stocks, but contributing to hundreds of thousands of sharks being killed for their fins every year. Paul has dedicated the last decade of his life to investigating and exposing this cruel industry in an effort to give the apex predators one more shot. But with some shark species down by as much as 90 percent, time is running out. Originally from Australia and now living in Hong Kong, he’s been interested in wildlife and conservation since he was a child. He laughs remembering that when all the other local children were catching turtles, he’d be secretly releasing them. At age 21, curious about the world, Paul found himself in London taking a course in photography. This led on to a full-time job as a stringer for European Pressphoto Agency in Hong Kong. “I’d walk down the streets every day and look for stories. I always felt so disturbed walking past the dry seafood markets and seeing piles and piles of shark fins, it was sickening,” he says. In 2005, Hong Kong Disney opened and offered Paul a gig shooting photos of the food outlets in the complex. They asked him if he had any conditions for taking the job, and he said he wouldn’t shoot shark fin soup. The offer was promptly withdrawn. “And that was it for me, that moment — it was time to do something,” says Paul. 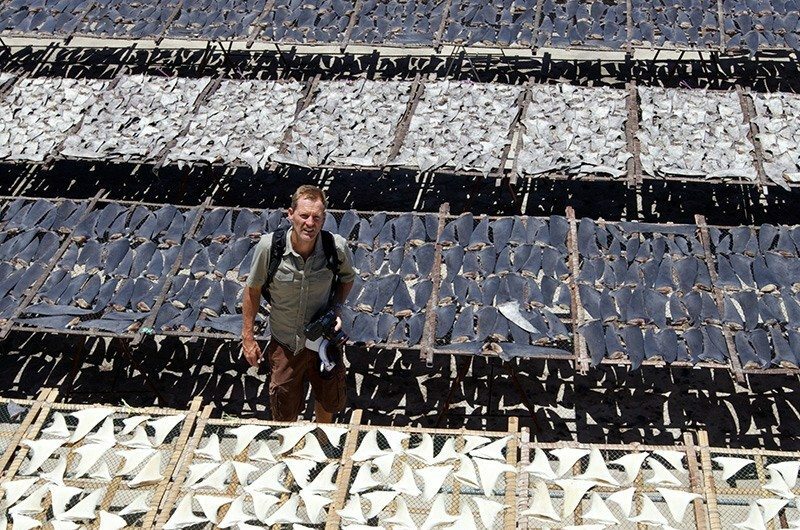 He met up with an old friend, Alex Hofford, and the pair concocted a plan to travel the world, from Mozambique in Africa and Yemen in the Middle East to Indonesia and Thailand, investigating the shark fin trade. They turned the material into a short video and a book written in Chinese and English, Man & Shark. It was the first ever bilingual documentation of the global shark finning industry. But Paul’s trip also served to expose a previously little-heard of black market that was wreaking devastation on the gentle cousins of the shark: mobula and manta rays. In Indonesia, these peaceful giants were being hunted to the brink of extinction for their gill plates, which are used in a questionable herbal remedy and fetch a high premium in Chinese markets. Thanks to the hard work of Paul and others, the rays were formally added to the Convention on International Trade in Endangered Species (CITES) in 2013. Following the listing, the hunting of mobula and manta rays was banned in Indonesia. Also in 2013, a WildAid report showed that consumption of shark fin soup was down by as much as 80 percent. 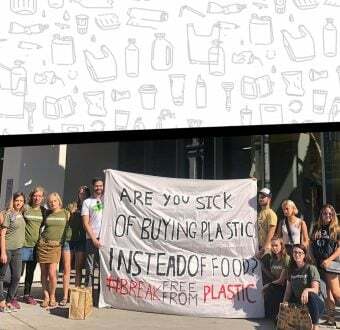 “I’m very positive and hopeful that we’ll win this fight, and young Chinese consumers are much more aware than they ever were — it’s the younger generation who are driving this change,” Paul says. But there is still more to be done. A new trend in China has seen shark oil being used in Omega-3 pills. The crème de la crème ingredient in these capsules is the vulnerable whale shark. It was Paul and Alex’s undercover investigation into an illegal whale shark processing plant that caught the attention of Louie Psihoyos, the director of Oscar-winning documentary The Cove. Louie was working on a new film project Racing Extinction and asked Paul to help out on it in Hong Kong and China. 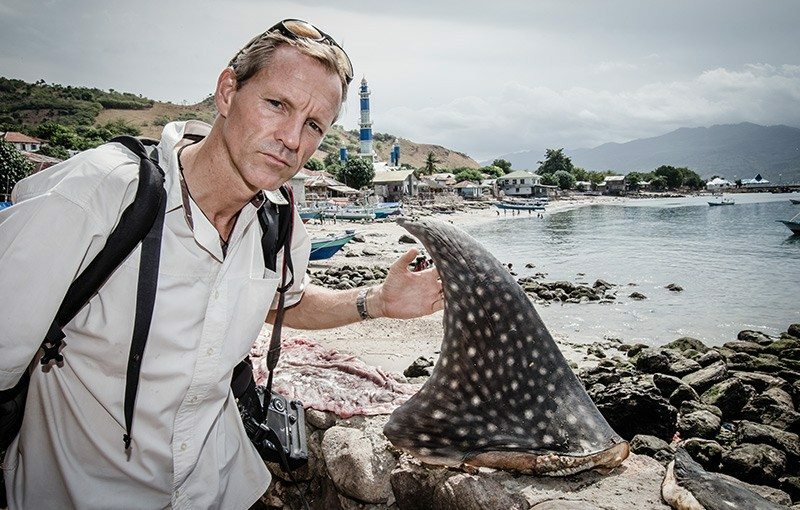 “Our investigation of the whale shark plant had reached crossroads, but when he approached me about filming a further investigation for Racing Extinction, I was hesitant about exposing my identity,” Paul says. Racing Extinction, in cinemas now, uncovers the world’s most dangerous black markets and explores how human behaviour is causing a sixth mass extinction event. It’s a much-needed slap in the face that drives home the fact that unless we change now, the impending extinction of species such as sharks will drastically change the planet and life as we know it. Sophie Schroder is a communications specialist with Greenpeace Aotearoa New Zealand. 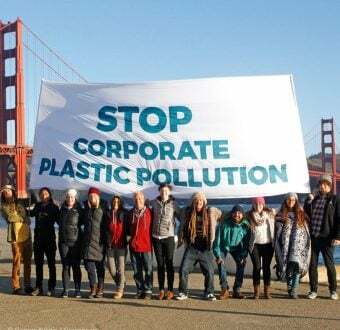 Demand Companies Take Responsibility for the Plastic Pollution Crisis!